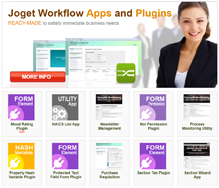 Joget Workflow v5 is an open source platform to easily build enterprise web apps for cloud and mobile. The App Center now offers seamless integration with the Joget Marketplace so apps can be installed at the click of a button. A new signature form element is now available to capture a user’s signature. This allows users to draw a signature using a mouse or touch screen. Joget is built on Java using the proven and popular enterprise libraries Spring Framework and Hibernate ORM and in v5 they will be upgraded to the latest available stable releases (Spring 4.1 and Hibernate 4.3) to take advantage of all the performance, stability and security improvements available. Performance in the Joget Workflow v5 core platform has been optimized by minimizing hotspots through refactoring and caching, showing vast improvements in some use cases for even higher scalability and larger deployments.